Can I Use Non-HE Detergent in a HE Washer? Laundry has certainly evolved over the years. One of the biggest advances has been in the types of washers and the washing detergents they require. In our last post, we discussed the newer high efficiency washing detergents and how they are used in both standard and HE washers. This one will look at the use of non-HE detergents in a high efficiency washer. First let’s look at what HE washing machines are. These are washers that use less water in the wash and rinse cycles. These newer washers are designed to be the most energy efficient on the market today. They are designed to also use less energy than washers manufactured in previous years. Most are recognized as an HE washer because of their front-loading capacity. In recent years top load machines have been added to the HE lineup. Front loading machines have been used in European countries for years. These washers came into the American market in the mid-2000s. Before the rise of high efficiency washers in America most of us thought the best way to make certain our laundry was as clean as possible one had to use loads of detergent and water to create lots of suds. The soapy suds then were supposed to get our laundry really clean. Most standard machines on the market today will use up to 41 gallons of water with each and every load. Today’s HE washers only use an average of 28 gallons or less with most using as little as 14 gallons per load. This will save on average 6.000 gallons of water a year per family. The biggest concern when it comes to HE washers is in the detergents used. While technically any detergent including the HE types can be used in a standard washer the same is not true for a high efficiency washer. The use of a non-HE detergent can cause confusion in your machine’s computer board and cause damage to the washer. Your machine could stop and your clothes may not be cleaned and rinsed properly. The cost of an HE detergent is compatible with other types so there is no reason not to use one. As we noted in our previous blog post with any detergent, we recommend that you read the directions carefully. If you feel you need to fill the soap dispenser up for more effective cleaning, then add water with the HE detergent to fill the dispenser. Refrain from using too much detergent. Follow directions as they’re written on the detergent box. When too much detergent of any kind is used clothes will not clean enough. Excess soap leaves your clothing with a residue that will make them look and feel dingy. This is true of either type of washers. 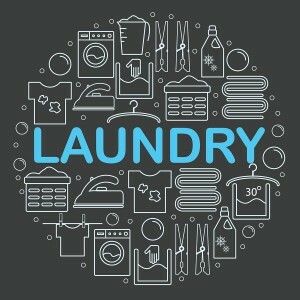 If you are being run ragged, just attempting to keep up with all your extra laundry, give our Raleigh laundromat a try! We offer state of the art machine for washing and drying your clothes. We also offer laundry services that include dry cleaning, wash-dry-fold, and stain removal! Don’t get behind on your family’s laundry. We are here to help! Visit Laundry Express soon!